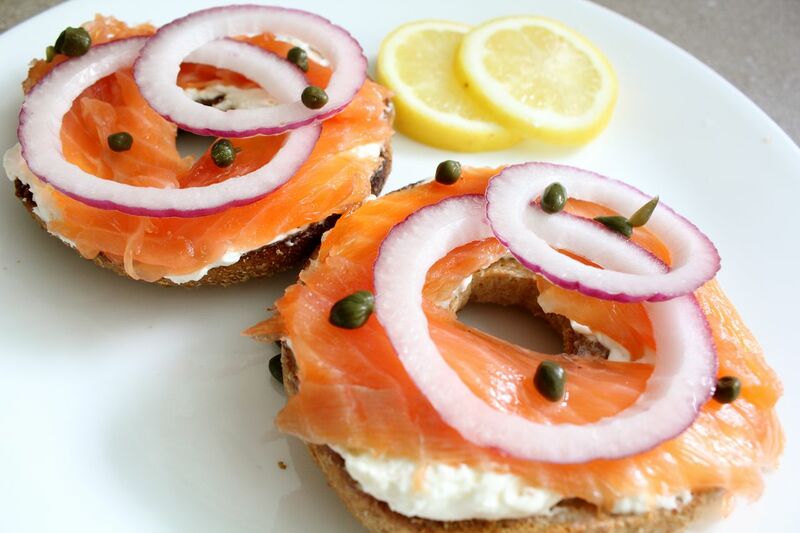 I was pretty darn proud of myself when I first made homemade bagels, but I think this homemade lox tops it. Challah! Who knew it was so easy to make you own lox? Now I do! Plus it’s so much cheaper than store bought. Salmon curing and saving money all rolled into one- how quintessentially Jewish! Initially I was a little confused at all the lox names out there- smoked salmon, nova lox, gravalox, lox. Are they all the same thing just under different personae a la Beyonce and Sasha Fierce? Or was each its own creation? Turns out I made lox today- gravalox has some herbs like dill incorporated and smoked salmon aka nova lox is smoked after the curing process. 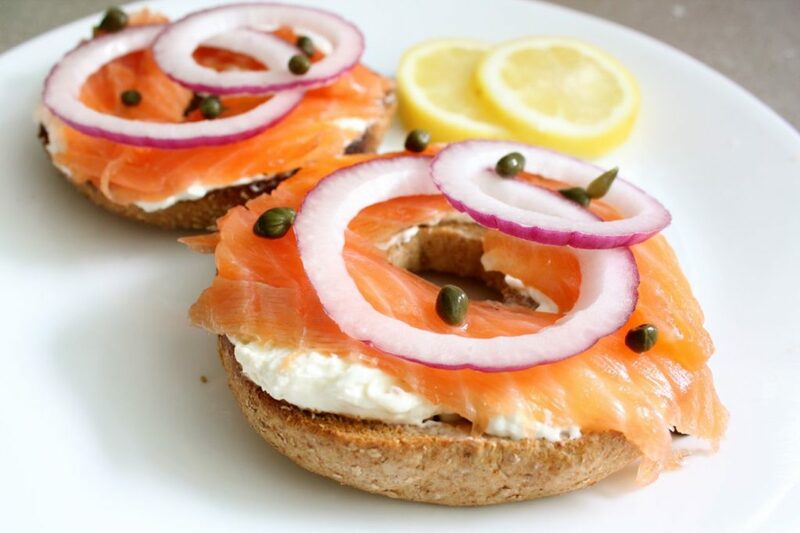 Just plain lox is the simplest but also just plain tasty. Homemade bialy sold separately. Here is all Jew need! I told you this was easy! First up, check your fish for any pin bones. Those are the tiny bones along the thick side of the fish. Your salmon may not have any- mine didn’t! But if you do simply remove with tweezers or your hands if you are dexterous like that. Next up, mix your salt and sugar. I used a ratio of 2:1 sugar to salt. But 1:1 would work too. 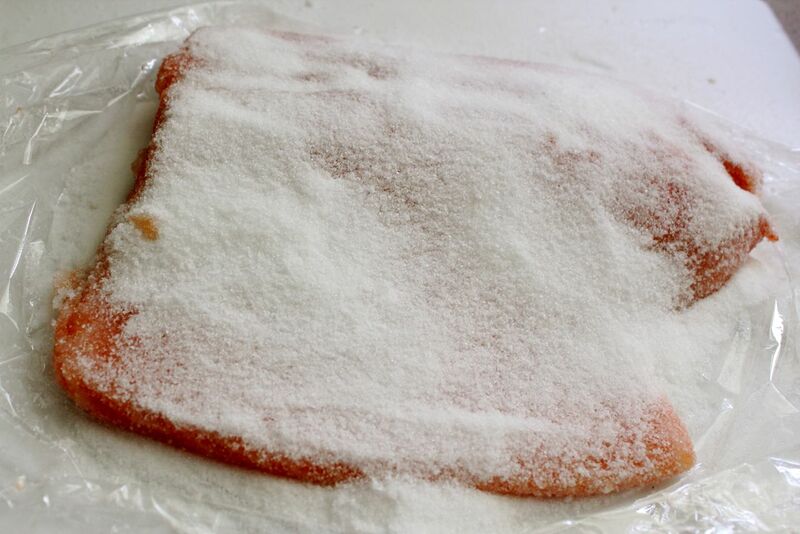 The salt does the actual curing by drawing out moisture and keeping the fish fresher and the sugar helps your salmon from not tasting like a salt lick! (Mmm Salt Lick.) Then simply cover the salmon completely on both sides in the mixture. 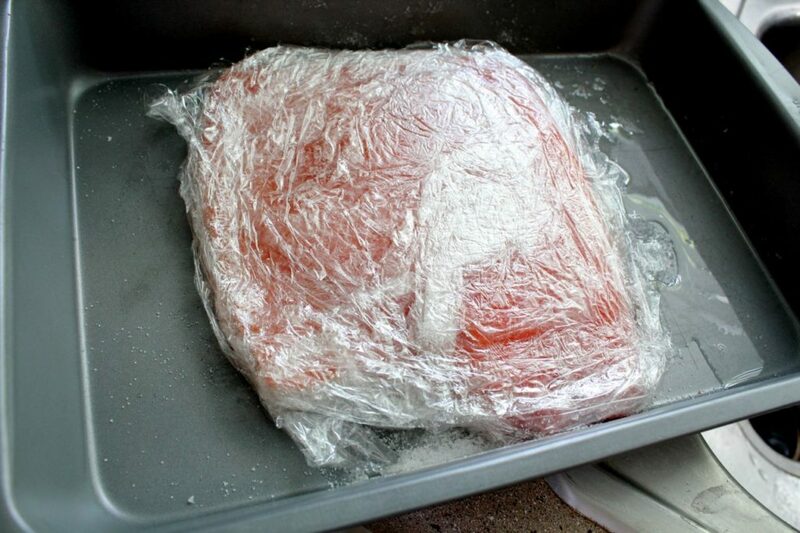 Then cover your fish tightly with saran wrap. Cut a slit in one end where the fish juices can escape. Mmm fish juices. Now we have to refrigerate the lox for curing! I put mine in a cake pan. Then covered it with my toaster pan. Now you want to tilt the salmon curing contraption so the fish juices (sorry) drain to one side. I used a sauce pan top to hold up one side of the pan. Those beers are the roomie’s- I stick to classy drinks only. Now the hard part- the waiting! I’m soooo impatient. Blah. After 24 hours check on your salmon. It should start looking like lox and some of the fish juices (new drinking game. Drink when I say fish juices) should be piling up. 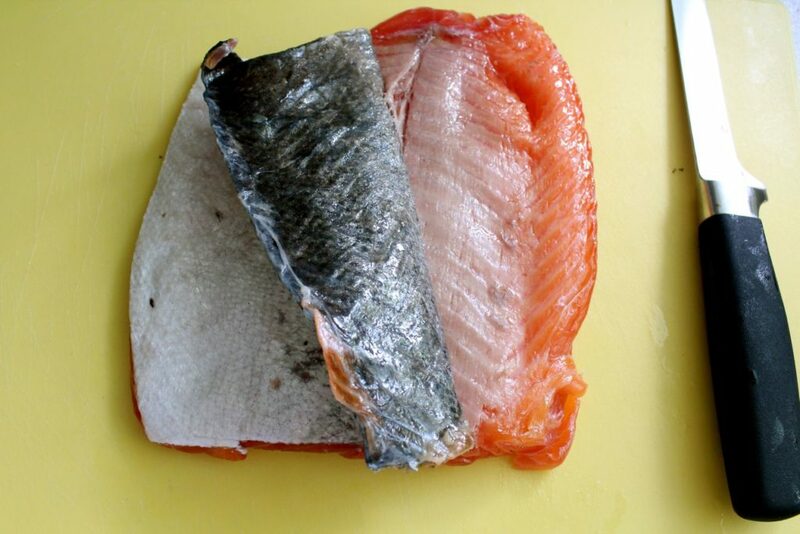 Check on your salmon- if all the salt/sugar mixture is gone, reapply and rewrap. Drain the fish juices (drink!) and put the lox back for another 24 hours. If the salmon is still covered in the mixture, no need to reapply, just refrigerate for another 24 hours. I didn’t take photos of this because it basically looks the same as above! And my camera was waaaay in the other room. After 48 hours total your lox should be done! Now unwrap the lox and wash it off well. The skin should peel off easily at this point. If it doesn’t, you can always filet it off with a sharp knife. Now just cut off small pieces on an angle against the grain and you’ve got lox! At this point you can smoke the fish, but I like it as is and I was hungry. There you have it! 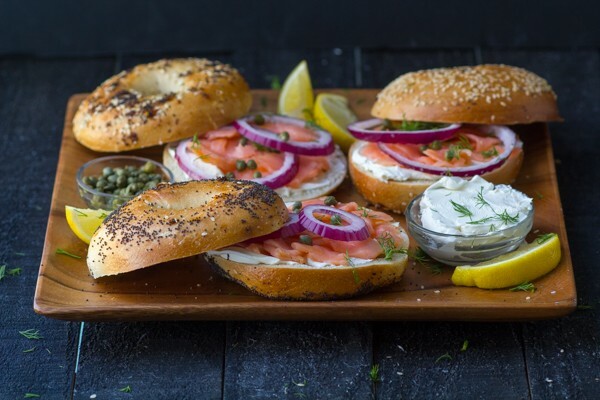 Now you can invite some friends over for brunch of homemade bagels and lox! How domestic of you. 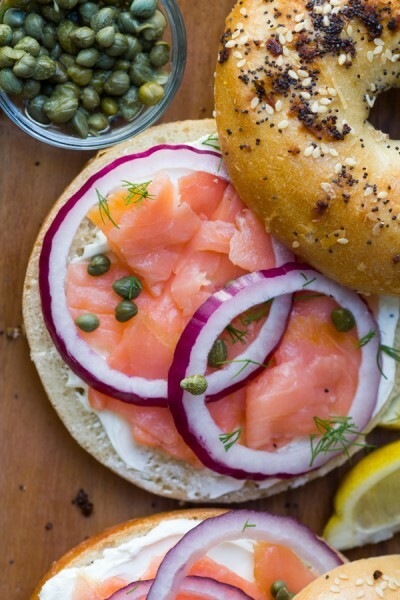 I like my lox with the classic accoutrements- over a toasted bagel with schmear, onions, capers and a squeeze of lemon. Dill would be nice too! 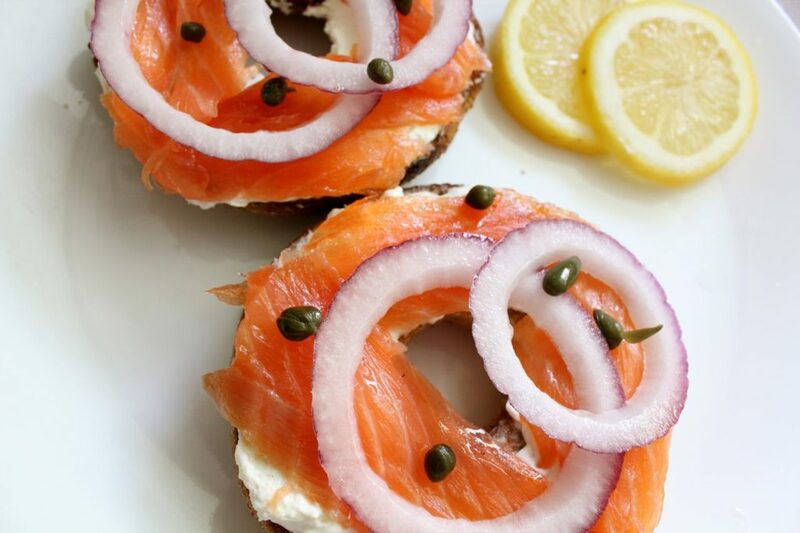 Homemade lox is easy and affordable to make! 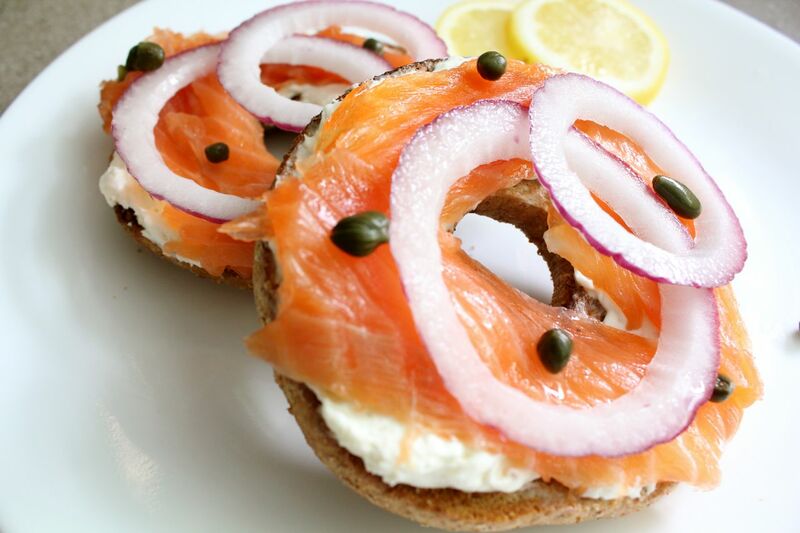 Bagels, red onion, schmear, capers, lemon and dill for breakfast! First up, check your fish for any pin bones. Those are the tiny bones along the thick side of the fish. Your salmon may not have any- mine didn’t! But if you do simply remove with tweezers or your hands if you are dexterous like that. Next up, mix your salt and sugar. Then simply cover the salmon completely on both sides in the mixture. 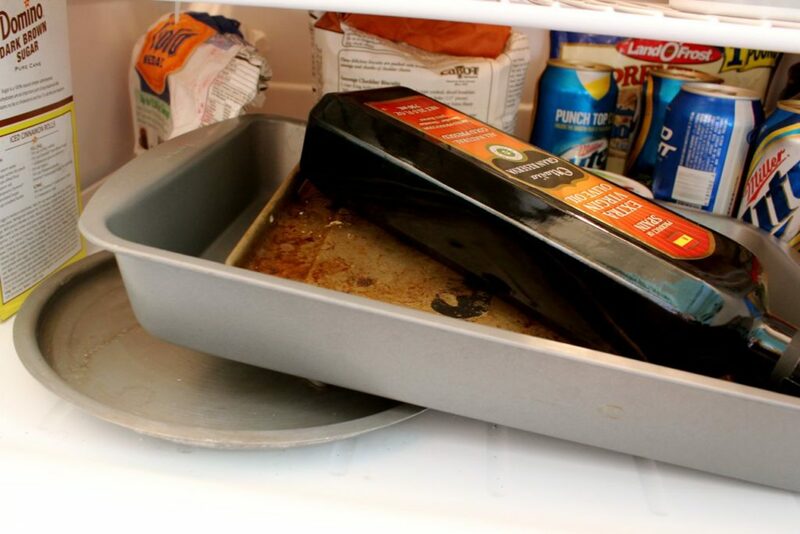 Then cover your fish tightly with saran wrap. Cut a slit in one end where the fish juices can escape. Now we have to refrigerate the lox for curing! I put mine in a cake pan. 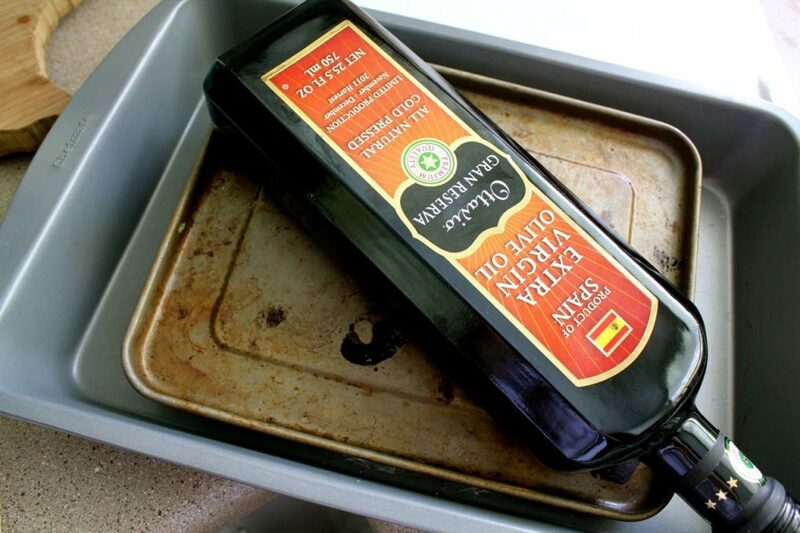 Then covered it with my toaster pan and weigh it down with a bottle of olive oil. Any heavy object will do! Now you want to tilt the salmon curing contraption so the fish juices drain to one side. I used a sauce pan top to prop up one side of the pan. After 24 hours check on your salmon. It should start looking like lox and some of the fish juices should be piling up. 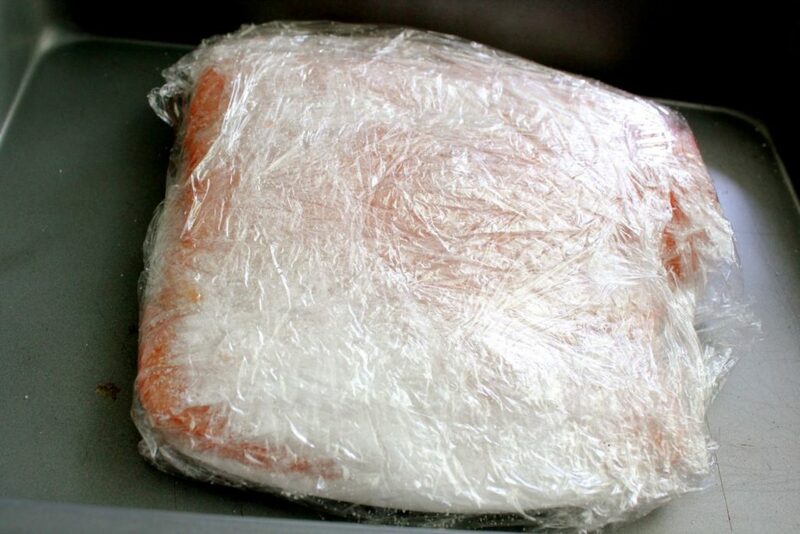 Check on your salmon- if all the salt/sugar mixture is gone, reapply and rewrap. If there is still salt on the fish, no need to reapply. Drain the fish juices and put the lox back for another 24 hours. Now just cut off small pieces against the grain on an angle and you’ve got lox! Cook time is curing time. This takes the cake or the carp or whatever. Homemade salmon is more work than my mind can process – I am exhaused and going back to sleep. But Mazel Tov, you have achieved beyond any member in our family going back 3000 years! Thanks Bubbe! 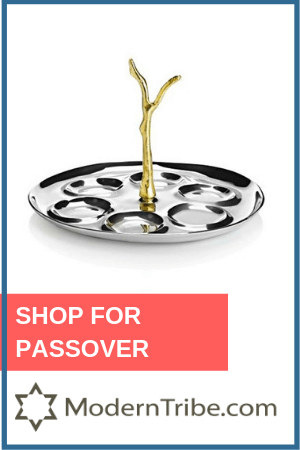 Now I know where I get my love of puns from- Jew! Amazing!!! Who knew? I’m so trying this- great blog!! In a time where everyone wants everything done and ready-made (you won’t find store-bough frozen lasagne at our place) , your idea is refreshing . As the title suggests, home-made aka self prepared food. Thanks, Prag! I totally agree- people rush too much! And this recipe was really very little hands on time. Oh my gosh I am beyond impressed! I love lox!! But I have never attempted to make my own. I always assumed it was super hard and difficult. Not so! I am going to give this a go! Thanks!! Thanks, Kelly!! No I actually don’t belong right now. I did go to Temple Beth Israel for Rosh Hashannah a few years ago though. I’d love to join y’all sometime! There are more complicated methods including smoking after curing, but this way was easy and very tasty too! Informative, funny, entertaining! I have some in the fridge right now, working its magic. I always take it one more step by refreshing the lox in fresh cold water for an hour or so. Less saltiness, more loxiness. Great tip on the water! HAHA Jew are too funny! One more tip, Amy: homemade lox freezes really well. I usually cut them into 4 oz. pieces and individually wrap them tightly in plastic wrap (vacuum packing would be better); that’s enough for about 4 bagel-halves. Added bonus: because of the high salt content, they never freeze rock-solid, so you can easily shave razor-thin slices right from the freezer (I use a very sharp filet knife), and they thaw in just a minute or two. I sleep better at night, knowing I have those little treasures in the icebox. And so will Jew! “I sleep better at night, knowing I have those little treasures in the icebox.” Best line ever. This is a very simple recipe, and that’s good. The one I use is the gravlax recipe on “cooking for engineers”. That’s 2 tbsp kosher salt (or sea salt), 2 tbsp sugar, and 2 tsp pepper, and (secret ingredient) 2 capfuls of gin….plus a whack o’ fresh dill. Wrap up and leave in a container in the fridge for 2 to 3 days. When it comes out, I rinse & rinse & rinse, and soak a couple of times, to get as much salt out as possible. Next step is optional, but I like to cold smoke it for 3 to 4 hours, wrap and refrigerate, and eat the next day. Good tip with the gin! I’ll try that next time. That’s really fun! We corn our own beef + made pastrami! 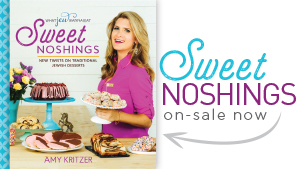 OOh I haven’t made pastrami yet- I’m adding it to my list!! After about 40 hours of curing, my salmon tasted quite fishy. Not at all like the stuff I get at the store. Any suggestions on how to not have that overly fishy flavor next time? Hi Lisa- the main thing I can think of is maybe the fish wasn’t fresh enough? 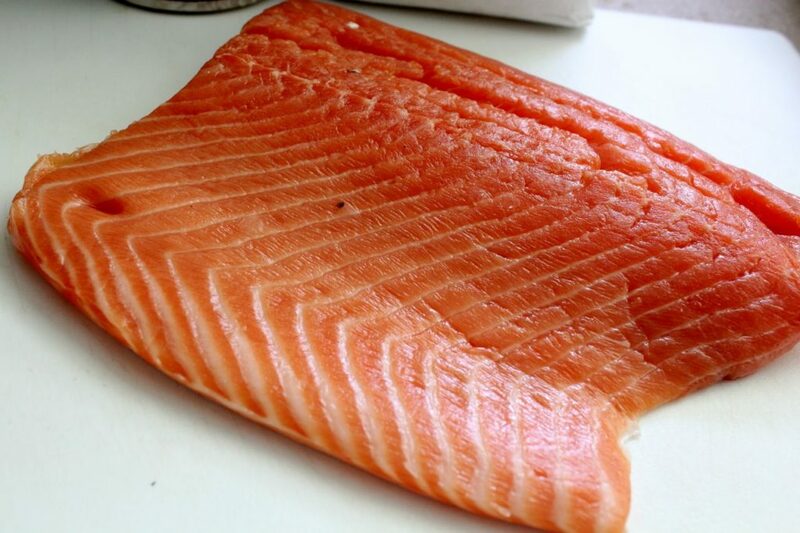 King Salmon is the best quality and produces the best lox, but any good quality wild salmon should work great. I got Scottish salmon. They said it was flown in that day, but maybe they lied. Also, I’m not sure if it was wild or farm. I got rid of the fishy flavor by throwing it in my smoker for 45 minutes with some apple wood chips. So all was not lost! Huh that’s strange. Hopefully they didn’t lie but I can’t think of another reason why it would be fishy, and I didn’t finding anything in my Google search. Great idea with smoking it! PS: I’ve tasted others recipes homemade lox where they place a layer of fresh dill over the sugar and salt before wrapping it in cellophane… it adds a delicious light dill note to the flavor. Have you tried this method? Wait a minute… I can’t start now… it’s almost Shabbot! Oiy … goyisha kupp … what was I thinking, I’m REFORM now! Ha yes you can totally add dill or other herbs! Let me know if you make to! Make sure to use the best quality salmon. Thanks for the recipe. My wife and I just got back from fishing on Lake Michigan and have some serious poundage of salmon and lake trout. We’ll start the curing tonight and I can hardly wait till it’s done. Ooh yum that’s going to be amazing! Enjoy! Im a Catholic and even I use Kosher salt. It is far superior. I think this is a ridiculously easy recipe and it turned out great! Thanks for sharing, I love lox but rarely buy it because of the cost. Who knew? Awesome I’m so happy you liked it!! 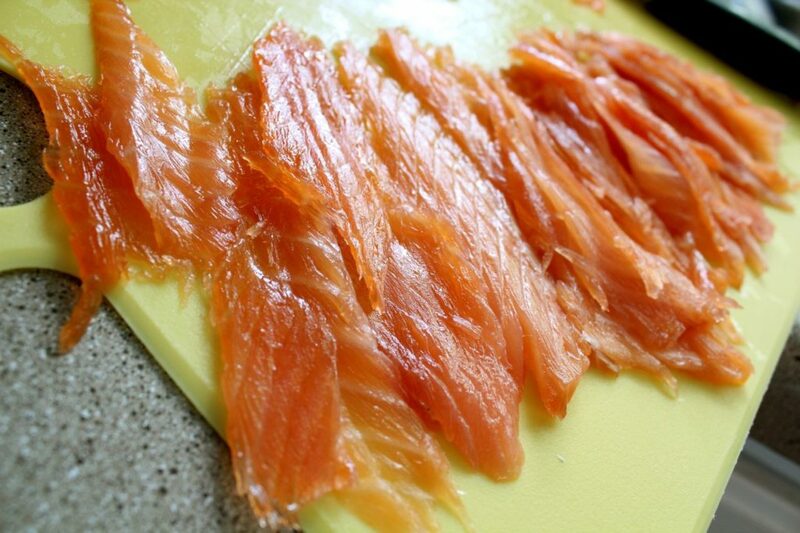 Sincerely Bubbe, Gravlax is from Northern Europe, and it includes a large handful of dill. The flavor has nothing to do with cold smoked lox, which is what Jewish New Yorkers are used to eating. 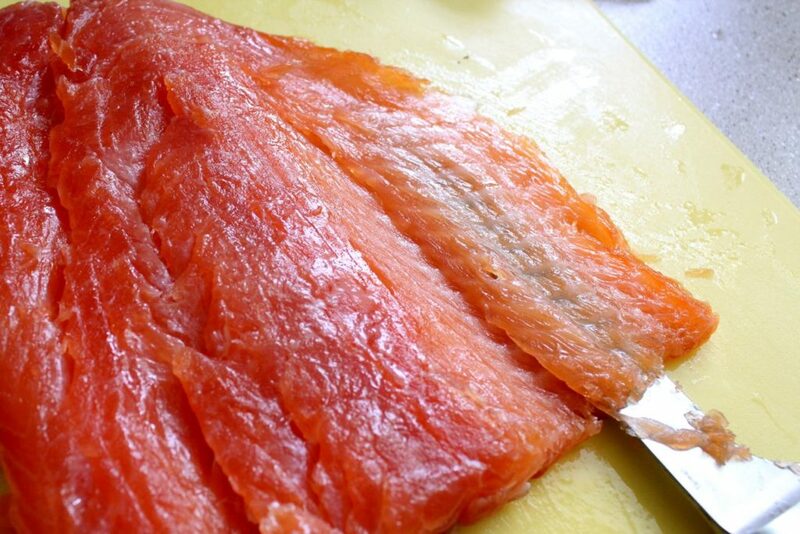 I see some of these people thought they were making real cold smoked lox, you should have defined it a bit better. 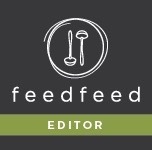 I am a cookbook reviewer, and I just wanted you to realize you forgot one of the most important ingredients! It also, should be served with hot mustard and black crackers or bread (pumpernickel). Wonderful for appetizers or for snazzy parties. I had some in Denmark, where they put a thick layer of butter on the cracker or bread, then the mustard and then the gravlax. Ha thanks, Marla! I hope to be half the woman Jenny was! 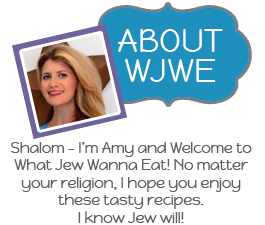 Hi Amy, just found your blog, it’s really great! I have a lot of “exploring” to do! 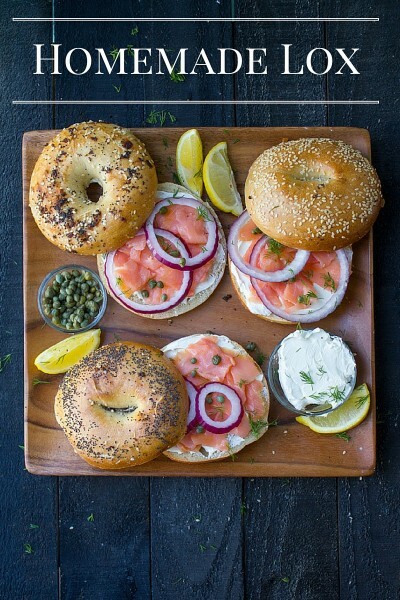 A few tips on your lox recipe. A very easy way to “smoke” the lox is to sprinkle a good amount of liquid smoke (you can get it at most supermarkets) onto the fish. Also putting the fish into a vacuum sealed bag such as Foodsaver is another way to process the fish in a sealed container without the need for weights. It also makes a neat watertight seal. I find that similar to making corned beef or pastrami, if you keep the fish in the vacuum bag for at least a week (in the frig of course!) it turns out better than the best deli! Aw thanks, Roger! Great tips! I have a vacuum sealer so I’ll try that next time. Amy, for most people, their vacuum sealer is one of the most underused appliances they have – along with their dehydrator ! As I mentioned, next time you make homemade corned beef or pastrami, try sealing the meat in a vacuum bag with the spices for a week or so, the results are unbelievably good. Your family and guests will rave. Jew wanna make me work too hard. Better be good or gonna go to the New Delhi downtown next time. Just made this for the second time and I wanted to let you know it’s still an amazing, relevant, tasty and money saving recipe. Sooo good. Aw thank makes me so happy! Enjoy the lox! Thank u for the LOX lesson! I am totally going to try it. I always thought it would be such a big hassle to make my own. Had no idea how simple it is ( except for the waiting time). I will let u know how mine turns out! Awesome! Let me know how it goes. It just takes a little planning! I have made this four or five times now. It’s truly a brilliant recipe. I even tried alder smoked salt, but it turned out meh. So many times, simpler is best. My mother passed recently and I brought this to her house, along with homemade bagels. As the family sorted through her things and photos, we took a break and had toasted bagels and lox. It was a special moment in a very tough weekend. When we went our separate ways, my brother and sister asked for your recipe. I was proud to serve your recipe. On a side note, my wife and I serve sliced kalamata olives instead of capers. Even rinsed, the caper’s brine tends to overpower. At least for us. Another tip for those who like red onion but find it also to be overpowering, after thinly slicing it, soak in ice water a few minutes to remove the bite. 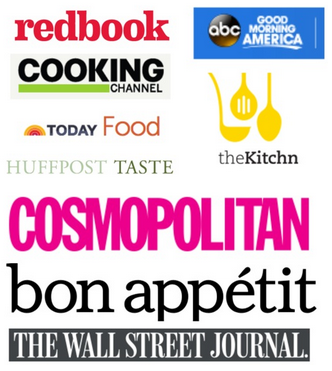 Thanks for all your solid recipes and sharing your passion for GOOD food. So glad you like the recipe! I’ve done a bunch of variations, but simple is best for sure. I’m sorry for your loss. That is what food is all about, right? Memories, and bringing people together. I’m tearing up a little that I was able to help in a tiny way during that difficult time. Good tip on the olives- I sometimes soak my red onion in a little salt and lemon juice to help that bite too! Thanks for writing and reading and cooking. Best blog! Love the humor! I think we need to hang out in the kitchen, cook and drink!